Harriet May Mills, born in Syracuse, NY in 1857, was a prominent leader in the struggle for political equality for women in New York State where she helped to build one of the largest suffrage organizations in the country. A tireless traveler and public speaker in support of the enfranchisement of women, she traveled and organized all over New York State, and was called to help lead suffrage campaigns in California, Michigan, Ohio and other states. She testified before Congress and frequently addressed national suffrage conventions. Both a gifted speaker and an effective organizer, Mills was a friend and respected associate of the leading suffragists of the day - Lucy Stone, Susan B. Anthony, Carrie Chapman Catt and Elizabeth Cady Stanton. Harriet May Mills came from a family of prominent abolitionists and she graduated from Cornell University after having entered the school just two years after it first opened its doors to women. Mills never married. 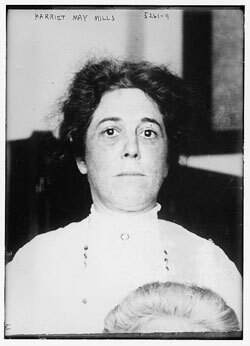 She dedicated her life to the cause of suffrage, earning an independent living first as a teacher, then as a paid statewide organizer and finally in appointed positions she received in recognition of other work on behalf of the New York Democratic Party. Following the ratification in 1920 of the 19th amendment to the Constitution extending the vote to women, Harriet May Mills turned her considerable political experience and organizing energies to the need to bring women into the mainstream of American political life. That year she was a candidate for statewide elective office, running for secretary of state on an unsuccessful ticket with Alfred E. Smith, candidate for reelection as governor. She continued to be active in the Democratic Party, supporting Smith when he successfully campaigned for governor in 1922 and for the presidency in 1924. She became acquainted with Franklin and Eleanor Roosevelt and she and Eleanor worked together in state party politics. In 1928, Mills accompanied Franklin while he toured the state campaigning for governor, often joining him on the speakers’ platform particularly to address women voters. At the age of 75, she was a member of the Electoral College that sent Franklin D. Roosevelt to the White House in 1933, and an honored guest at his inauguration. She also found time to involve herself in other civic and political causes of her day. In 1919, she had founded the Onondaga County Women's Democratic Club; the first such organization in the state and served as its president for 16 years. In 1923, she was appointed as the first female State Hospital Commissioner concerning herself primarily with the problems of the mentally ill.
Mills died in Syracuse on May 16, 1935 after a period of illness.